SKK Baby Soft Stroller Car Seat Activity Toy with Rattle Teether Mirror Puppy by SKK BABY at My Pregnancy Place. MPN: T00002A3. Hurry! Limited time offer. Offer valid only while supplies last. Spiral Shape:Wrap arround easily to most rails like:crib,car seat, strollers,bed,carriers,bassinet or play gyms. 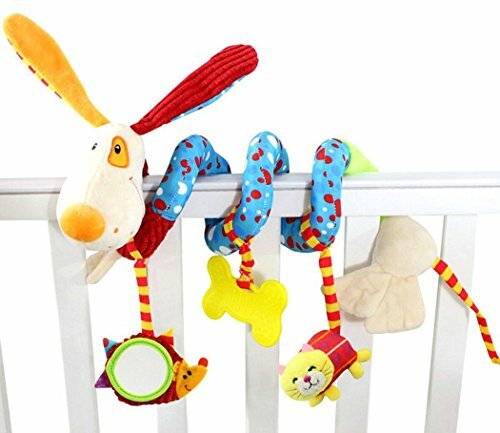 Developementle: Multicoloured and multifunctional with hanging rattle, teether, baby mirror, crinkle paper ,develop baby vision,hearing tactilesense, hand-eye coordination,etc. Healthy: Safe and soft plush fabric ,baby enjoy it without worrying. Gift: Great gift for newborn infanttoddler boys and girls. If you have any questions about this product by SKK BABY, contact us by completing and submitting the form below. If you are looking for a specif part number, please include it with your message.